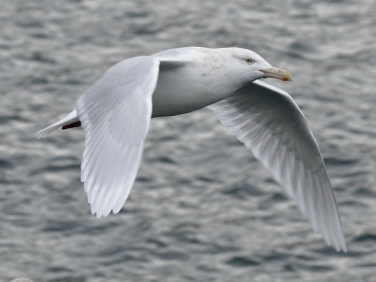 The Glaucous Gull that has been at Newlyn Harbour, Cornwall for a couple of weeks was feeding on mackerel scraps thrown in by two boys fishing at the end of the harbour wall. Its larger size and white primaries made it stand out from the hoards of Herring Gulls. The light wasn’t great for photography and having a moving off-white subject set against an uninspiring pale sky was never going to produce a great shot. However, it was surprising how fine the definition of the trailing edges of the feathers was bespite them appearing almost translucent. 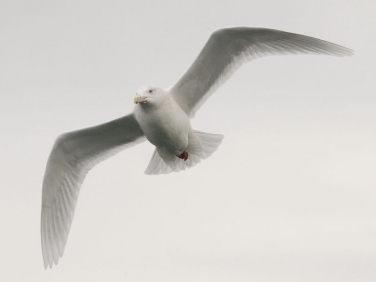 Insight into Glaucous Gull (Larus hyperboreus): one of the largest gulls to be seen around the UK with a wing span of up to 158cms. It is mainly an uncommon winter visitor from the Arctic regions of the Northern Hemishere to western and northern coastlines of the UK but will wander inland onto reservoirs and land fill sites.